CNN’s reporting of science issues is admittedly not the best around, but a story on their website this morning looks like it was written by a fifth grader. First of all, the headline is absurd. “Science figures out”? Really? How about something like “researchers determine”? Yes, clearly cats have evolved to keep furniture dry. Ain’t nature amazing? Wow, these scientists must be really professional if they spent hours doing their research before publishing a paper in Science. No wonder they keep rejecting my papers. Actually, I have to give CNN some credit- this might be the fewest words ever used to make serious research seem like a middle school science fair project. I need to get me some of those complicated formulas. They make you sound so science-y. I think I’ll stop disparaging the writing of our local newspaper. At least they didn’t typo? Also, my cat ‘Possum thinks that “Cutta Cutta” has a silly name. Ed Yong rocked my socks with his review of that paper. Seriously, we should just syndicate that guy and sell “Not Exactly Rocket Science” to any newspaper that wants good science reporting. Thanks for the compliment! However, I do think some of the complaints of the CNN piece are a bit too nitpicky. Yes, the headline is absurd but I don’t really have a problem with the rest of it. I’m not really defending CNN’s news coverage, but I do think that clunky writing doesn’t really count as “science journalism fail”. It’s not inaccurate or misleading – even the counter-top bit, when you look at the context in the sentence. It IS however astonishingly clunky and, my word, I hate the scattershot structure, random details everywhere, and bizarre constructions. But I think that when we rail against pieces that look like they were written for schoolchildren, we have to remember that *the average American/Brit* reads at the level of a schoolchild. I see your point, Ed… I just get so frustrated when I read things like this. See you in a couple of months at Science Online! Because that bit actually *is* misleading! It’s not like the cat does frickin’ calculus in it’s head. 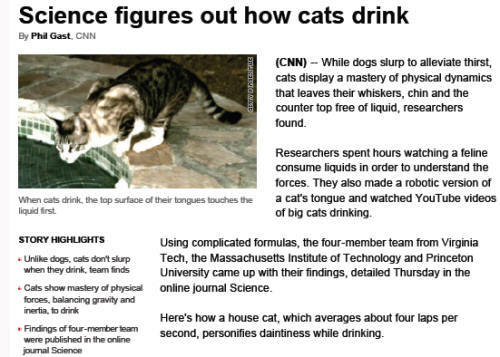 I don’t know… cats do “personify daintiness”, maybe they can also do calculus in their head? I complained bitterly when CNN cancelled their Science desk and folded science back into their general reporting bureau. The do “tech” separately but not science and especially not biology. They as right across the park from the Aquarium and yet the reporting was backsliding. I have no good news for you. We just have to work that much harder to get the message across. They make it sound like a Discovery Institute project. I have the tendency to judge those who use poor grammar. I’ve always been made fun of for having a fascination with action potential and hormone feedback loops (Leave it alone, it’s just my thing, okay?) but this just make my nerdy obsession more legitimate. I usually am quite annoyed at science coverage by the mass media, but I really don’t see what’s wrong with this article — yes, they could have maybe actually shown one of the “complicated” formulas, but they didn’t actually say anything wrong as far as I can tell — quite often when covering genomics, the journalists confuse mapping with sequencing a genome and treat them as synonyms when they are actually two entirely different things.